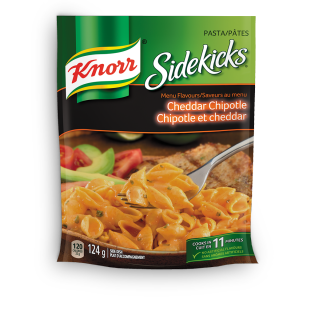 Add a hint of smoky chipotle flavour to your dinner routine with this great cheddar chipotle pork and pasta recipe. Wheat pasta, modified milk ingredients, maltodextrin, cheddar cheese (cheese cultures, salt, enzymes), salt, corn starch, spices, yeast extract, chives, modified corn starch, tomato powder, hydrolyzed soy protein, sodium citrate, natural flavour (milk), high oleic sunflower oil, chipotle chili pepper, onion powder, natural colour, disodium inosinate, disodium guanylate, sugar, lactic acid, citric acid, silicon dioxide, tocopherols. In an 8 cup (2 L) microwave-safe bowl, combine water, milk, and contents of package. Microwave uncovered at HIGH about 15 minutes,* stirring halfway through cooking, or until pasta is tender. Stir in margarine, let stand 2 minutes. *Microwave ovens vary; adjust times as needed. Directions above developed in 1200 watt microwave oven.